Endless ways to bundle routings with a single solution? Versatile. Secure. That’s MOC. HellermannTyton’s comprehensive family of tube and pipe routing clips means unlimited possibilities for auto, truck and heavy equipment manufacturers. What makes it different? Our patented clip design results in superior retention, preventing inadvertent disengagement under vibration and during assembly processes such as vacuum fill. Yet, these products quickly and easily attach to routings to help installers maintain high productivity. If your routings have ever vibrated loose or popped out of their retention system, you know the frustration and potential for damage to your hoses and wires. So do our design engineers. Ergonomic – easy to install. Durable – able to perform under temperature, chemical and physical stress. Tough but flexible – the right materials combined with a reinforcement ridge along the outer curve of the clip. Combined with our patented retention system, this clip will outperform the competition. Applications: This product line is ideal for fuel, brake, vacuum, venting, cable and harness, HVAC and powertrain thermal management. For side-by-side routing and securing, a perfectly configured, off-the-shelf part that matches your application is rare. That’s why our engineers developed hundreds of modular configurations for our open clips and locking clamps. Twelve different product designs and numerous size combinations deliver a “custom solution” right off the shelf. Rotatable dual routing clips keep two routings secured and separated. A swivel coupler allows them to rotate independently of each other to accommodate parallel and non-parallel routings. Two options for the coupler location provide alternative access for bundles. This rotatable dual routing clip and clamp combination keeps two routings secured and separated. Use when one routing requires the added assurance of a 360-degree locking enclosure. A swivel coupler allows them to rotate independently of each other. This configuration couples an MOC clip with a cable tie to keep two routings secured and separated. The tie provides additional security against axial slip by clamping around a solid tube, pipe or harness. The swivel coupler allows the two routings to rotate independently of each other. Demonstrates all the features of the MOC Cable Tie, except with a locking clamp in place of the clip. Use when the added assurance of a 360-degree locking enclosure is warranted. HellermannTyton's unique retention clip features an integrated fir tree for easy insertion into an existing panel hole while exhibiting high extraction resistance. The round fir tree fits securely in a 6.5 (+/-0.4) mm hole. The 4x oval fir tree option will not rotate in the mounting hole and exceeds automotive requirements for the four most common oval sizes: 6.2x12.2 mm, 6.5x12.5 mm, 6.5x13 mm and 7x12 mm. Demonstrates all the features of the MOC Clip with Fir Tree, except with a locking clamp in place of the clip. Use when the added assurance of a 360-degree locking enclosure is warranted. There’s always room for a new configuration in the event your unique application warrants it. Need to add a third or fourth clip or a different mount? Let’s work together to route your tubes and wiring in the most efficient and effective way possible. 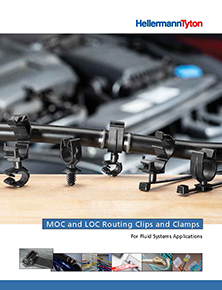 The MOC family of clips and clamps demonstrates HellermannTyton’s advanced positioning in the automotive fastener market. More information can be found at the links on this page. Or, please contact your sales representative for additional assistance.